This day we must leave Bangkok and end in Chiang Mai, the Northern capital city, but we’re not going to take a direct flight as we want to visit Sukhothai in the middle. The way of doing this is by taking a domestic flight to Phitsanulok at 7 AM. 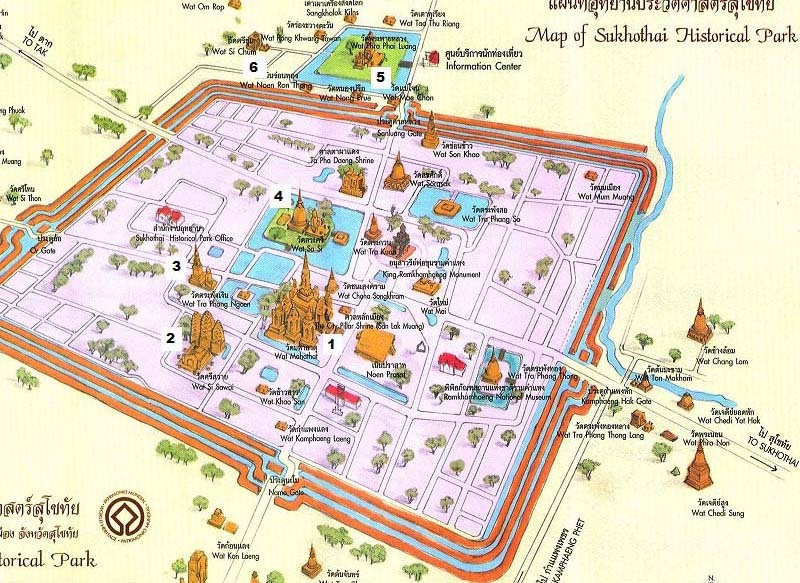 There we would take a bus to Sukhothai and hire a tuk tuk for visiting the Historical Park. Around noon we would take a coach to get Chiang Mai is around 5 hours. At 5 AM we’re at hotel’s desk where they have ready our take-away breakfast, keep the fullest of our bags until our return in a week and get a taxi for us to the airport. Somehow, the taxi driver gets into bargaining while I keep answering to use the taximeter. He starts asking 500 Bahts, then offers 400 and he finally make us change of taxi. The new driver tries to bargain too with a first price of 300 Bahts, but he finally sets the taximeter. We must pay two tolls in our way to Don Muang airport, the old international airport which is used now for local low cost airlines. The tolls costs 105 Bahts (45+60) and the taxi ride is 150. As there is no traffic at these early hours we reach the airport in 20 minute, so at 5:20 AM we’re checking in our baggage. We’ve eaten our breakfast in our way inside the taxi. The packs were quite ok, but I’m still thinking about what the breakfast buffet is like in the hotel and I can barely keep a tear inside. I have got the consolation our last day in Thailand we’ll be there again for enjoying it again. We have a nice flight with Nok Air where we get some water and mini pizza. It lands on time and at 8 AM we’re with our feet over the small Phitsanulok’s airport leaving the funny airplane. We’re offered a taxi immediately to bus station by 180 Bahts, compared with the price of Bangkok’s one I think it is too much and I answer we’re going to take the bus. We spend one hour around before assuming there is no buses or tuk tuks or any other option of leaving the airport but the taxi. We’re requested more for it now, but we finally get the original rate. The procedure once at bus station is quick: 37 Bahts each and one hour drive to Sukhothai. We choose to leave the bus in Old Sukhothai as is in there where the historic park is and some of the buses to Chiang Mai stop there too. So we skip the stop in New Sukhothai just to find ourselves in the middle of a road where there is no station – where I thought to keep the baggage in - but a hut where the people selling drinks try to help us as hard as they can, but as they’re not speaking English, we’ve got a problem to tell what we need. Our problems are al solved at once when a tuk tuk pass by the road and answers 400 Bahts to my request os rate for visiting the six temples I’m bringing written in a list. As this tuk tuk is big enough we can bring the bags with us and keep them in the vehicle all the time during our visits. This way we start our trip to the historical park entrance thinking that, at the end, we must come back to that road for a bus to Chiang Mai. The tuk tuks here are from a different kind of the previous ones. As we’ve been in a motorbike pulling to us in Siem Reap, and seen Bangkok’s tuk tusk as a complete vehicle by itself, these here are composed by a motorbike pushing a two-wheeled sort of trailer with two rows of seats at each side, so the driver can see by the middle of them, and covered by a cloth. The place is quiet and beautiful. The lakes full of floating lotus flowers and the ruins of temples with white Buddhas and worn downs chedis are far enough from what we’ve seen in Ayutthaya or Ang Kor as per deserving a visit by themselves. Our driver stops at the entrance of every temple in the list. The distances avoid these visits to be able of being done by foot. The walled area is large and flat and you can see the temples around from the one you’re visiting at the moment. The last temple is amazing, with a Buddha showing through the walls making a cube, but this Buddha is huge. You can compare the size with me in the picture below. This tour is very pleasant and it results to be quite shorter than I thought when reading about this place: in two hours we’ve visited all six temples and ready to go. I don’t know the reason and I don’t want to ask about it but we’ve not been asked for purchasing the tickets or asked for them which I know is 600 Bahts by the two zones we’ve been in. Our driver seems happy with our timing and drives us to New Sukhothai’s bus station instead than that piece of road we were delivered at. It is a few kilometres of distance and it makes us have a lot more of options as we’re going to be able of taking any bus to Chiang Mai. So we buy some sandwiches and some other food to bring with us and get into the 1 PM bus. The trip is not as comfortable as expected because there is no way of running away from the freezing air conditioning inside the bus and the more than six hours the ride finally takes. The TV has showed a sort of local show with some comedians in gags with a curious sense of humour. We’re asked for 150 Baht for a taxi ride to our hotel from Chiang Mai’s bus station. I know it is close to here, but we’re so tired for even start a bargaining and we reach our hotel at 7:30 PM. The hotel is really nice and it seems somebody has been thinking about how to make every detail a piece of design. Banthai Village occupies both sides of the narrowest street, with around just two meters between them. These sides are full of well cared, beautiful and high tropical vegetation. We don’t feel like going out but as we’re hungry we start walking to the river looking for the famous restaurant Riverside. We can see how different this city is to Bangkok: with narrow streets and lower buildings with just two floors. It is dark and we’re walking through lonely alleys but we don’t feel as something could happen to us as we would in a place looking like this in our own country, this is the magic of this country. The percentage of tuk tusk vs cars is a lot higher here and, as we’re not reaching the river, we take one of them to the restaurant by 30 Bahts. The dinner is great and everything is delicious. We’ve ordered two Pad Thais and BBQ ribs for me and filet mignon for my wife with a couple of beers and the bill is 800 Bahts. There is also live music and our table is by the river. A nice end for a long day, on which we’ve covered a long distance in a bunch of different vehicles. Tomorrow morning we’ll be picked up early for a very special day.